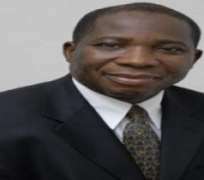 Lagos (THEWILL) - Mr. Samuel Ereola Kolawole, a former Managing Director of Trade Bank Plc and immediate past President of the Chartered Institute of Bankers of Nigeria (CIBN) Plc was found dead in a room in Kwara Hotels, Ilorin, Kwara State. Sources say Kolawole checked into his hotel room on Sunday with an unidentified woman who works at a teaching hospital in the Northern part of the country. The police have taken her into custody. The former Managing Director was said to be in good health before the incident but was reported to have had heart related conditions. He was certified dead at a nearby hospital. The General Manager of the hotel, Mr. Lance Hurly confirmed the incident but declined to speak further on the matter. Kwara Police Public Relations Officer, Mr. Ezekiel Daboh said the command was still waiting for details of the death of Kwara State born Kolawole. Trade Bank Plc went under in 2007.